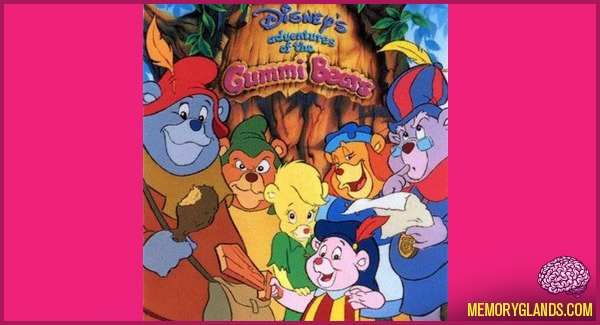 Disney’s Adventures of the Gummi Bears is an American animated television series that aired in the United States in the mid-1980s through the early 1990s. The series was the first animated production by Walt Disney Animation Television, and loosely inspired by the gummi bear candies; Disney CEO Michael Eisner was struck with inspiration for the show when his son requested the candies one day. The series premiered on NBC on September 14, 1985, and aired there for four seasons. The series moved to ABC for one season from 1989 to 1990, and concluded on September 6, 1991 as part of the Disney Afternoon television syndication package. Of the series’ 65 shows, 30 were double-features, consisting of two 11-minute cartoons, thereby bringing the series total to 94 distinct episodes overall. The show is well-remembered for its theme music, written by Michael and Patty Silversher.